While combination of XPL LED and 26650 cell can be optimized to achieve 2000 lumens output, Lumintop stay humble with their latest release of Lumintop SD26. Flashlight with either single or multiple 26650 battery formats is become more common nowadays. It gives the benefit of higher voltage lithium-ion battery and longer run time due to its battery size. I have reviewed some flashlights with 26650 battery before (Klarus G20 and Convoy L6) and this time I will write about Lumintop SD26. 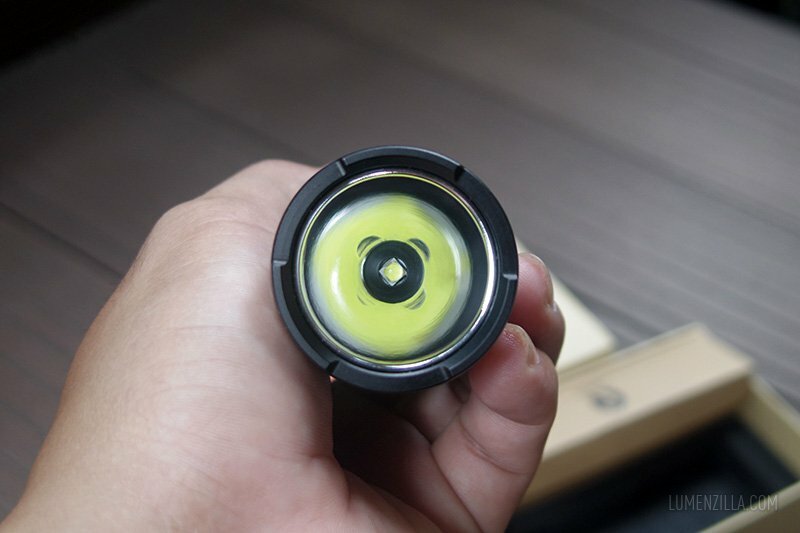 This flashlight was provided by Gearbest without any financial incentive so this review will be as objective as possible. 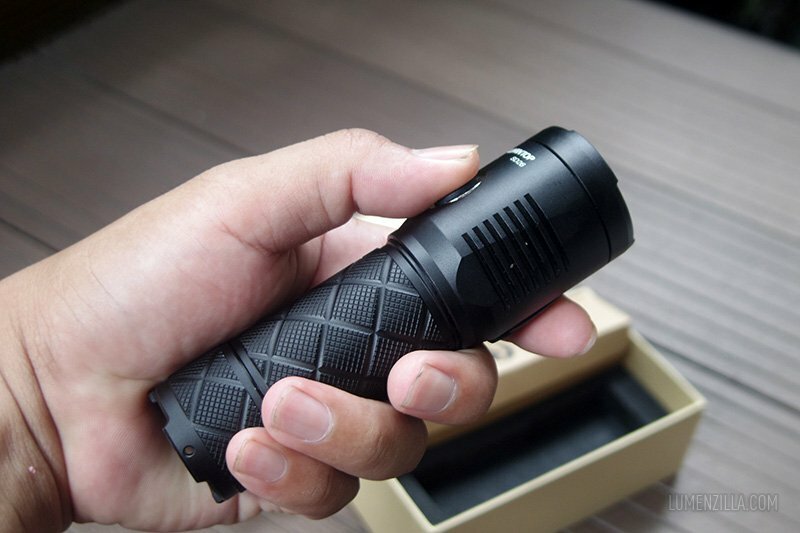 I also have a coupon for Lumintop SD26 at the end of this review if you interested to buy it from Gearbest. The flashlight arrived inside a strong and nice brown cardboard. 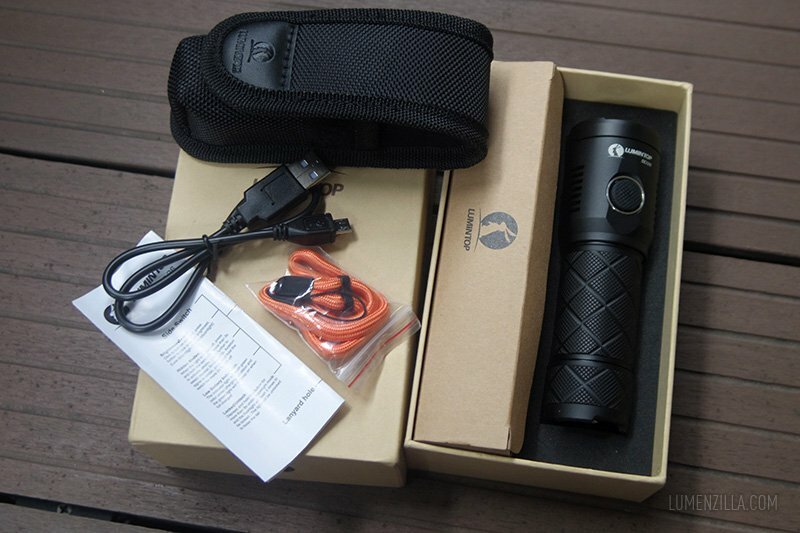 It’s a good thing because I can use its box for gift wrapping or use it to store the flashlight inside the box. Inside the box, there are flashlight, micro USB cable, orange lanyard, spare O ring, belt holster, and a manual operation sheet. There’s no 26650 battery included in the package. Upon opening the box, I took Lumintop SD26 and hold it, I feel that the size is just right for my hand — an average asian man. The knurling work also astonishing. 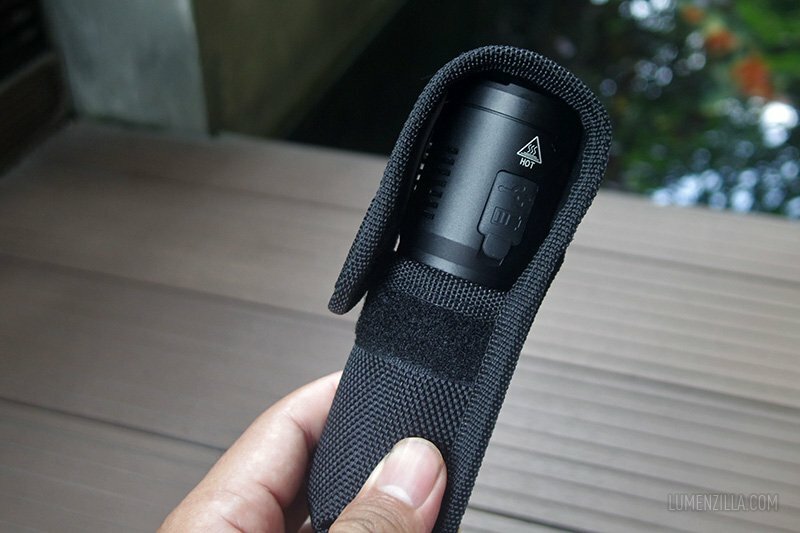 It has a large side switch to operate all functions on this flashlight, from turning on/off to mode selection. Despite its black color, it’s actually a translucent silicone switch with tiny LED inside for charging indicator. Looking at the “crown”, the bezel looks removable but I haven’t check if it’s glued or not. 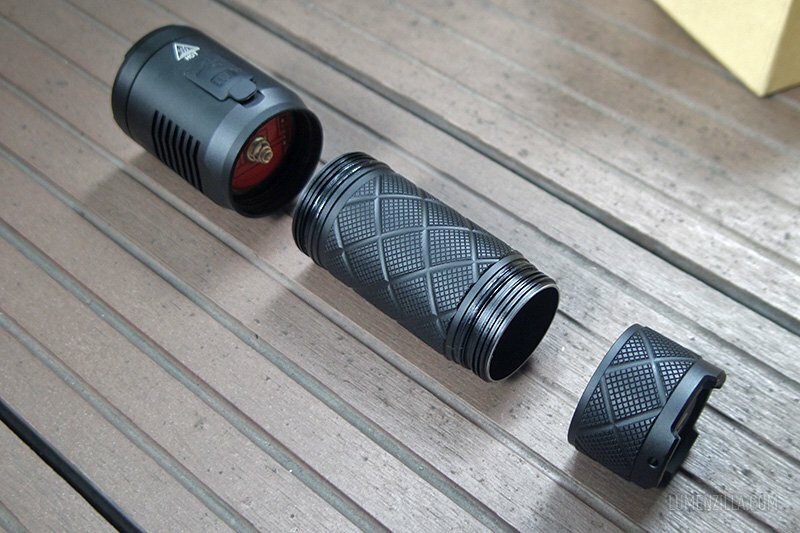 At the side, there are some fins for cooling down its head where the flashlight brand and model name is printed. 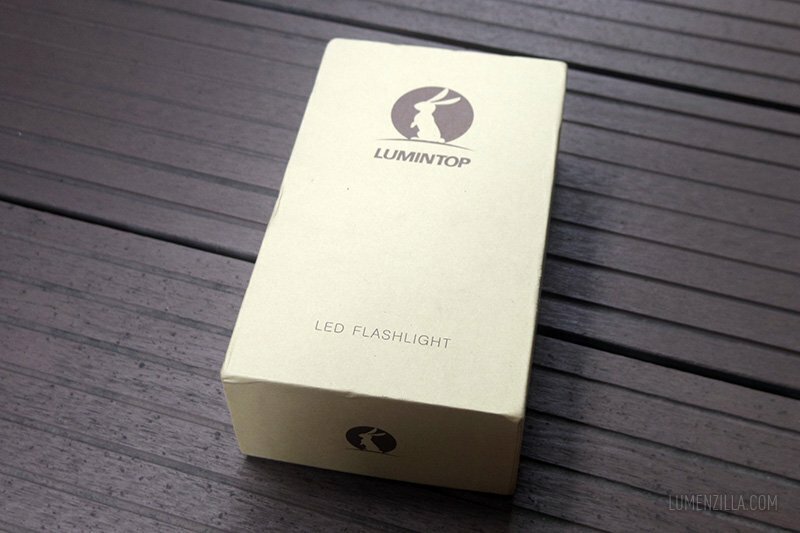 On its tail cap, there’s a rabbit logo of Lumintop and an hole for attaching the lanyard. It surely will be capable to tail stand, too. 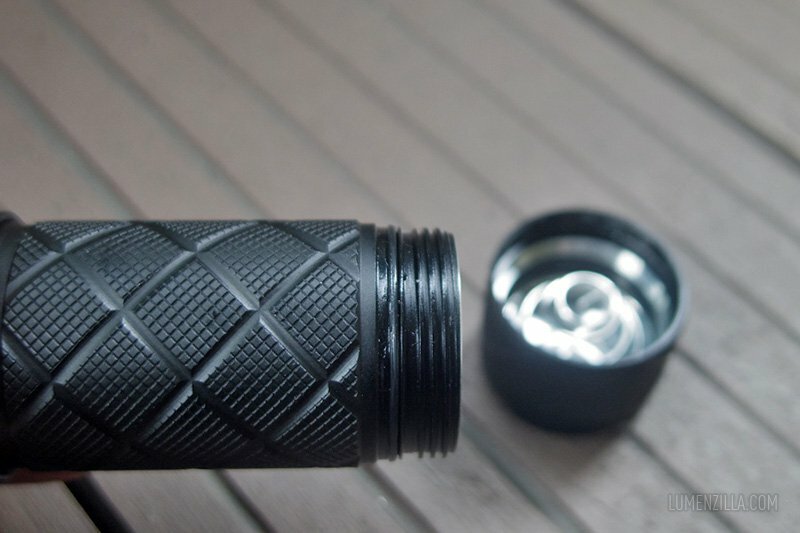 Then I went to disassemble Lumintop SD26 and found that it has square thread, very smooth and well-lubricated. At the background, you can see the spring on its tailcap. I wish it was gold-plated, but well, I can do a spring by-pass on it later. 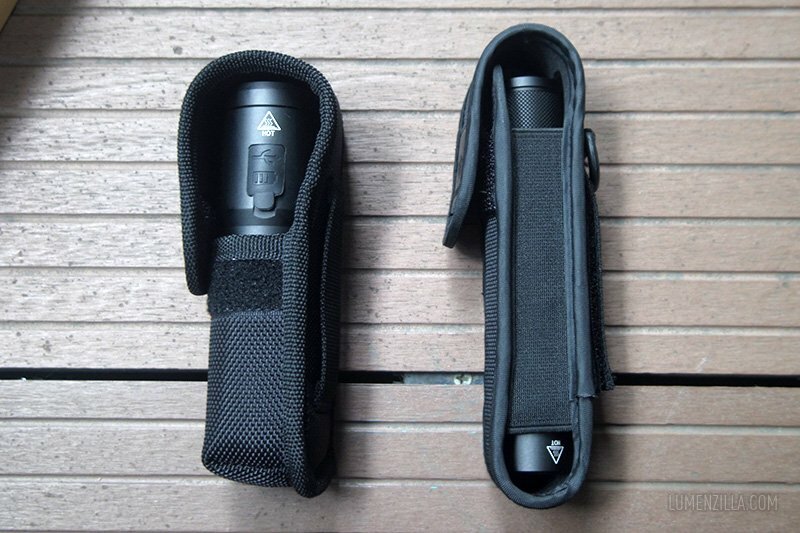 Here are the three main parts of flashlights. From left to right: head, body, tail cap. 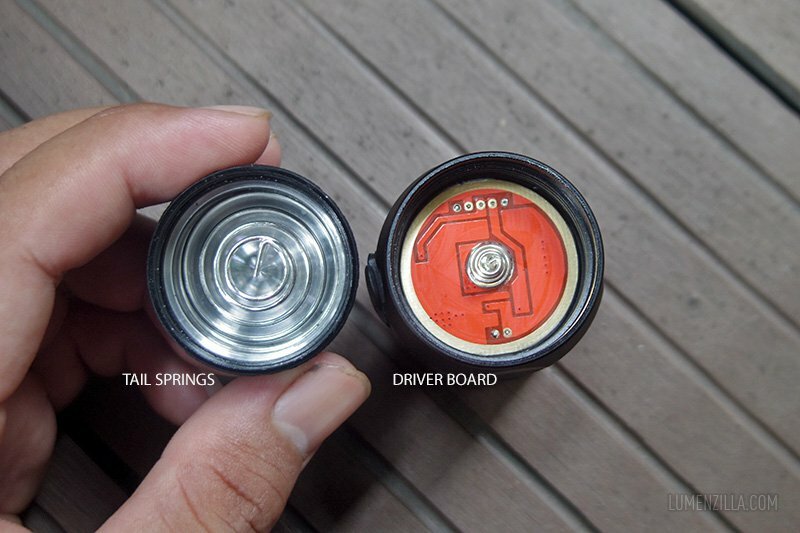 You can see the red PCB of the driver and its gold-plated spring on the head. According to its technical spec 2.8 to 8.4 volts current. It makes me wonder if I can put double 26650 cells and get double the output. 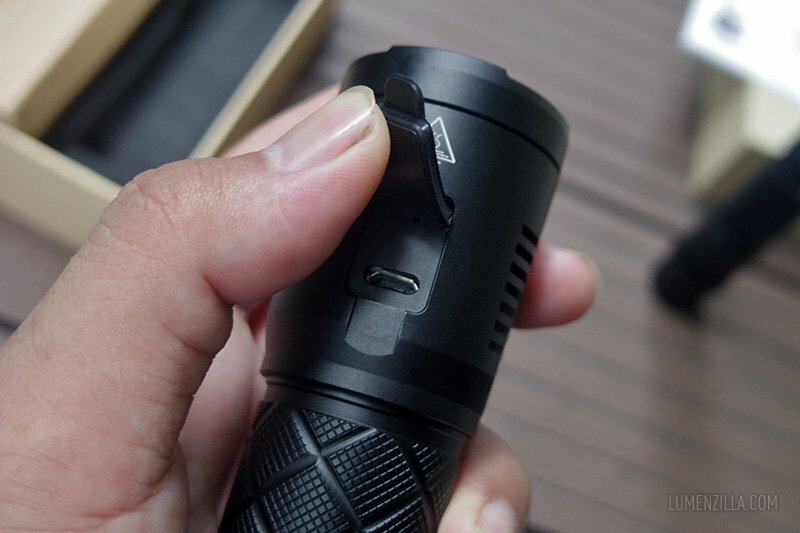 There’s a rubber cap protecting its micro USB port for charging 26650 battery directly inside the flashlight. During charging, a LED will lit under the side switch indicating the charging progress. Red LED for charging, green means finished. A holster is included in the package. Unfortunately the holster is too small, you can see that the velcro hook only covering half of the velcro loop area. I don’t know if all SD26 holster are too small but in my case it is. Here’s Lumintop SD26 holster compared to Lumintop EDC25 holster which seems better and stronger. One thing (among other things) I like from Lumintop SD26 is the operation mode, quite simple. Click its side switch and it will lit on the last used mode. If you just inserted a battery in it, it will start with turbo mode. Click on the switch will cycle the mode from Moonlight — or Super Low because it’s too bright for a moonlight –, Low, Medium, High, Turbo. Long press on the switch will turn off the flashlight. There are three hidden mode that can be accessed by long press the switch from off state. Press the switch for about 2-3 seconds and it will enter Strobe mode. Click the switch again to change the mode into SOS mode, and another click will enter “Aviation mode” which means short flashing every 3 seconds or so. As in normal mode, press again the switch for couple seconds to turn off the light. 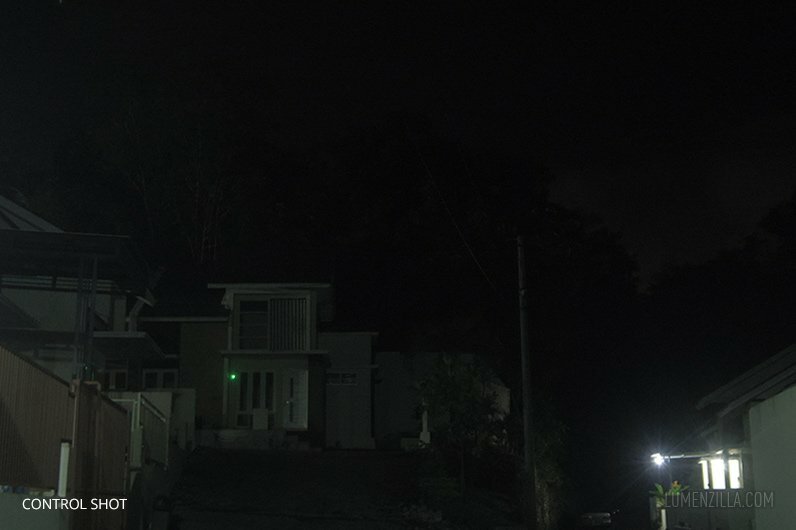 First, I apologize because the beamshot pictures isn’t as sharp as it should be because I haven’t found better place for long range test (I just moved into this area for few months). 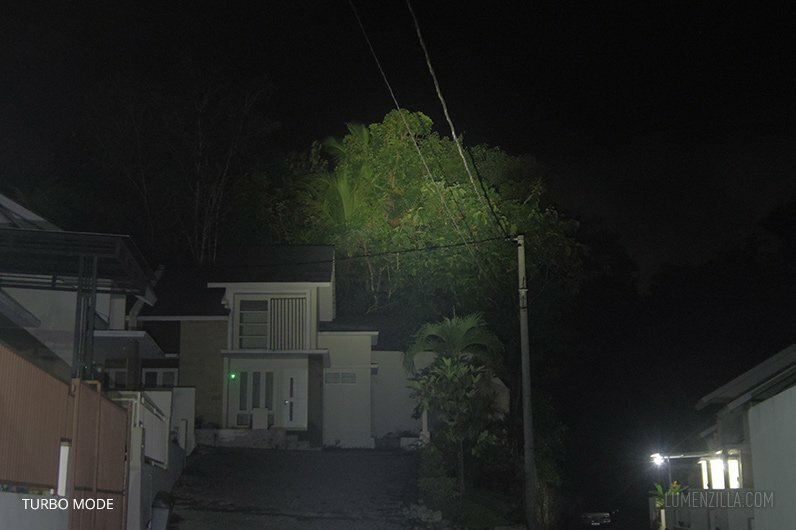 But I hope this beamshot will give you better insight of this thrower. All pictures are taken in 0.3 seconds exposure, f/0.2, ISO 500 using Pentax Q with standard prime lens. 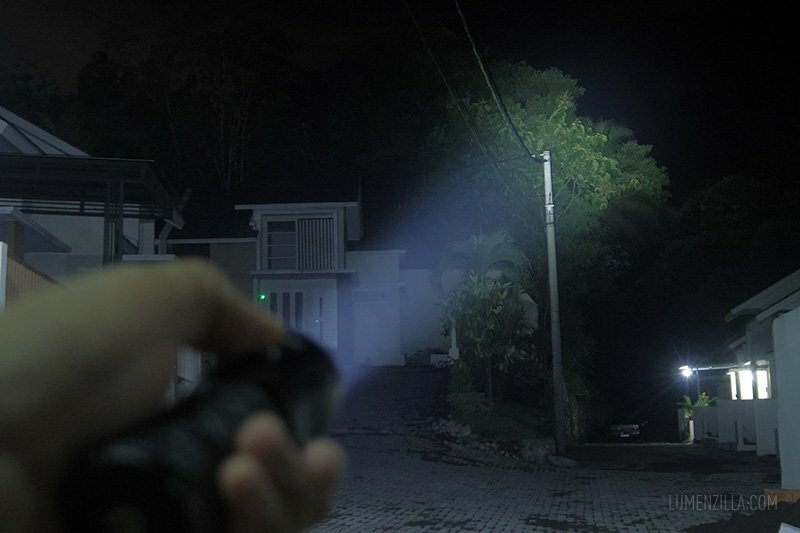 Lumintop SD26 is a good thrower with large hot spot and enough spill for illuminating the surrounding. 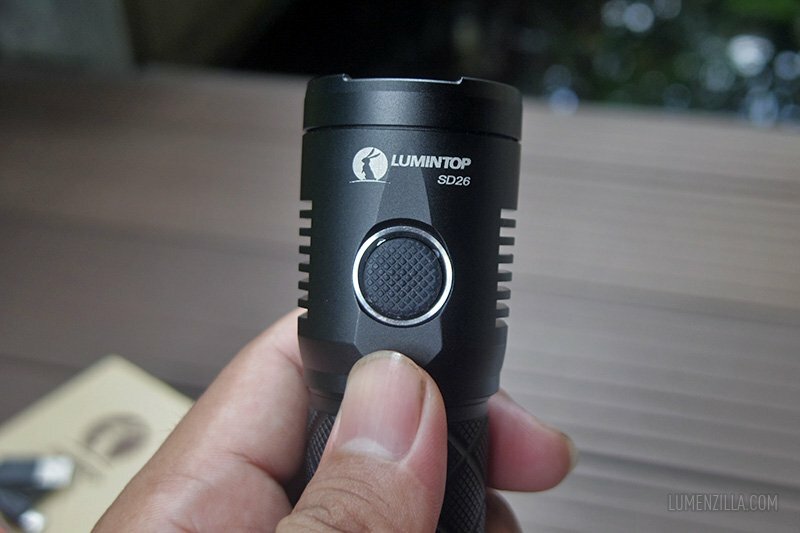 Lumintop SD26 is a well-machined flashlight with decent output. While I’m expecting greater output, say 2000 lumens, Lumintop SD26 is perfect for your all round flashlight. As I promised before, you can use this coupon when purchasing Lumintop SD26 from Gearbest. Just enter the code during checkout process and the price will be deducted.